Google as just released Google Earth version 7. Google Earth is an amazing tool for genealogy so new enhancements are always welcome! This new version enables you to explore a number of cities around the world in 3D, from Long Beach, California, to Rome, Italy. The 3D imagery uses the enhanced modeling capabilities, previously found on only mobile devices. In my video CD Google Earth for Genealogy Volume II I go into detail about 3D models and even give you resources for how you can get your own 3D models of everything from your house, to your ancestor’s home. Download the new Google Earth 7 and get even more 3D imagery. You’ll find comprehensive and accurate tours of more than 11,000 popular sites around the world, including our growing list of cities where new 3D imagery is available. A big change with this new version is the tour guide feature which serves as sort of a virtual local expert that suggests places nearby that you might want to explore and providing you with background information on the location. You’ll find the tour guide along the bottom of the screen, and it looks like sort of a film strip of thumbnail images representing various tours that are available. These change based on where you are on the Google Earth globe. Order gift copies of RootsMagic 6 for just $19.95 (plus shipping). You can also order other RootsMagic products at that same $19.95 price. Order the special holiday at http://www.rootsmagic.com/holidayoffer or order by phone at 1-800-ROOTSMAGIC (1-800-766-8762). According to a FamilySearch press release, “Within the next few months, FamilySearch will make Family Tree available to everyone on its website. The first of many updates planned for FamilySearch.org, Family Tree will provide a free and engaging way to discover, preserve, and share your family history. 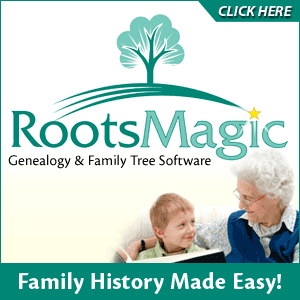 Family Tree will also offer specialized tools to make temple work for your ancestors even easier and more convenient. Watch an Introduction to Family Tree that shows 7 reasons to be excited about Family Tree. If you have questions about what Family Tree will be like or how it will work, you can log in to a special training website that offers online courses, how-to videos, informational handouts, and step-by-step training. Get started with Family Tree today by watching the introductory video or reading about it on the training website. Family Tree will be open to everyone in the next few months. The National Archives of Ireland has launched a new genealogy website at http://www.genealogy.nationalarchives.ie/ which will initially host the 1901 and 1911 Censuses, Tithe Apportionment records from 1823-37, and Soldiers' Wills from 1914-17. On November 29, 2012 Ancestry.com Inc., announced the launch of Newspapers.com, a web site designed to offer a collection of more than 800 U.S. newspapers dating from the late 1700s into the early 2000s. Comprising more than 25 million pages, Newspapers.com offers a historical and present-day newspapers ranging from the New York Times to small town and local newspapers throughout the United States. The yearly subscription rate is $79.95 for subscribers and $39.95 for Ancestry.com or Fold3.com members. Newspapers.com also offers a 7-day free trial that can be activated at www.newspapers.com. MyHeritage have just bought our long-term rival Geni.com - and also raised $25million in new funds. As a larger community, the users of MyHeritage and Geni.com will now receive matches with the other website family trees, and MyHeritage’s Record Matching, will benefit Geni's users, who will get access to historical records never available before on Geni.com. Lisa’s Answer: Congrats on your new blog! Remember posts can be short and sweet, and pack them with searchable keywords so other researchers can find you in Google Search. RE: 1000Memories. They have indeed changed up the website since the interview. I agree with you, it seems watered down now, and not as obvious as to how to make the most of it. They seem to be focused on "simplicity." “My Great Grandfather, Edmund Charles Clark, was a builder in Bendigo, and many of his houses still stand in Wattle Street Bendigo today. I spent a lovely day photographing them, but I cannot go up and knock on all the doors however! So I have a cute way of finding out just what those houses look like today especially on the inside. I have an alert in Google for "Wattle Street, Bendigo" and it works a treat. Every so often one of the homes goes up for sale or rent, and one of the real estate websites has pictures of both inside and outside. These come up on my search and I get to see inside the homes that are still standing. One is up for rent at present and here are the pictures from Realestate.com.au of 172 Wattle Street. Isn’t it lovely? It is still much in original condition. The Google alert function is really useful for genealogy, and I first found out about it from Genealogy Gems – so thank you very much for the gem." New Gem for Premium Members! The iPad is built for hitting the road and is ideally suited for family history due to its’ sleek lightweight size, gorgeous graphics and myriad of apps and tools. In this class I will teach you “the tablet mindset”, the best apps for the tasks that genealogists want to accomplish, and my Top 10 list of iPad Tips and Tricks. By the end of class you will be able to turn your iPad into a family history powerhouse!